We have settled back in to the Allston vihara after returning from a week-long visit to our nearest branch monastery, Tisarana, in Ontario, Canada. 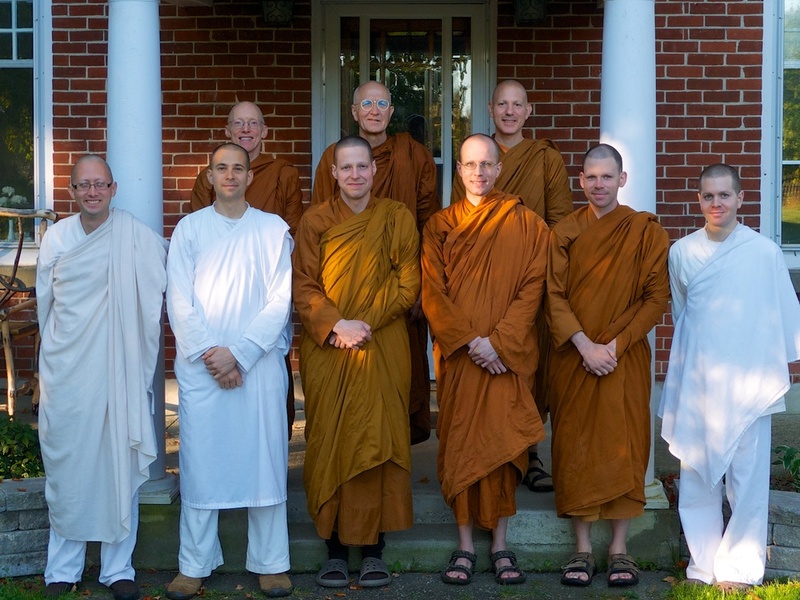 As I prepare to head out on our morning almsround to Allston, I reflect on how much has unfolded during these past months and how appreciative Tan Caganando, John and I feel for the warm welcome – and welcome change of pace – we were so generously given by the abbot, Luang Por Viradhammo, and the resident community at Tisarana. Tan Caganando and I were particularly grateful to be staying in kutis (huts or cabins) in a quiet natural setting, having been living in our unusual-for-for-us city digs since mid-July. Ajahn (or Luang Por, as we are beginning to call the more senior elders in our maturing Western branch monasteries) Viradhammo celebrated the day effectively marking his 40th vassa (years as a monk) just as we were leaving. Witnessing the blessings arising for the communities within and around his monastery, with a growing monks’ community and visitors engaging in various ways, many of us feel a powerful gratitude to those able to enter and stay in the monastic life for so long. We were also fortunate to spend a delightful afternoon and evening meditation at the nearby Sati Saraniya monastery where Ayya Medhanandi, now a bhikkhuni and a nun in the robes for around 25 years has similarly established a field of blessings for all – particularly her fledgling nuns’ community. We were grateful too to Luang Por Viradhammo (who has been involved in the establishment of five monasteries over the years) for helping us think things through regarding where we are in our own process of monastery-beginning here in New England. As you may know, we have been searching for available properties suitable for a forest monastery for much of the past two months. That search was hastened by the fact that a quite wonderful property was shown to us shortly after we arrived in late July: as it seemed an excellent prospect, we realized we’d better investigate other options if we were to make an informed decision so soon about pursuing any prospective site. This is the property in Temple, NH, where we held the day-long retreat on Sep. 21. The owners, Bruce and Barbara Kantner, have been extremely generous in their wish to support the arising of a monastery quite possibly on their land, and Bruce even offered to drive the three of us up from the vihara to Tisarana for the week and back, which I had suggested might give him a sense of what monasteries in our tradition are like. LP Viradhammo was especially helpful in helping us all consider the whole picture and how we might proceed. He has also accepted our invitation to join us in Boston at the end of the month for the end-of-the-vassa alms-giving ceremony, called a ‘Pa Bah’ in Thai, which supporters in Boston have asked if they can sponsor. This will take place on Sunday, October 27 at St. Luke’s and St. Margaret’s church in Allston, and is a traditional ceremony/festival that is held in lieu of a ‘Kathina Ceremony’ – where a Kathina traditionally requires at least five bhikkhus to have spent the vassa together. We being just two (Tan Caganando and myself) a Pa Bah will be held instead. We’ll be blessed to have Luang Por Viradhammo join us for this special event, offer a Dhamma Talk and be generally available on the day. We believe it’s the first time he’s been to the Boston area. Please put it in your calendars – everyone is very welcome!